If there is still any person out there second guessing Bobi Wine’s ability to market the people power movement to the outside world, then you need to watch Diamaond Platinum’s latest video ‘Tetema’ to quickly change your point of view. We are not trying to pre-empty out what Diamond Platinumz initially thought about before coming up with the video script but it can’t be a coincidence that the full consume might have drawn inspiration from some where else other than Bobi Wine’s people power colors. 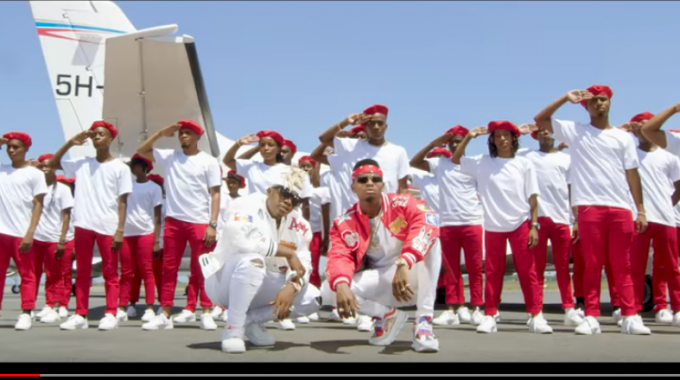 In the video, Diamond choreographers are seen donned in plain white T-shirts and red tight jeans icing their outlook with red army berets synonymous with Bobi Wine’s people power movement. In all fairness, Bobi Wine has gone out of his way to market the people movement internationally more than his counterpart Bebe Cool has done with the silent majority.